Last October, Dan and I took a 2 ½ week trip to gorgeous New Zealand. The country hadn’t previously been on our destination radar, but we couldn’t pass up a flight bargain, so decided to go for it. We stayed in a majority of Airbnb homes, as well as a couple hostels, and did not remain in any location longer than 2 nights. In order to accommodate our chosen travel dates, we had to have a 2-night layover in Honolulu on the trip out (wah!). The quick stopover was just enough to avoid travel weariness and try paddle boarding on the ocean (which turned out to be so much harder than on a lake/river). On October 24th, we took off on another 9ish-hour flight to Auckland, New Zealand. 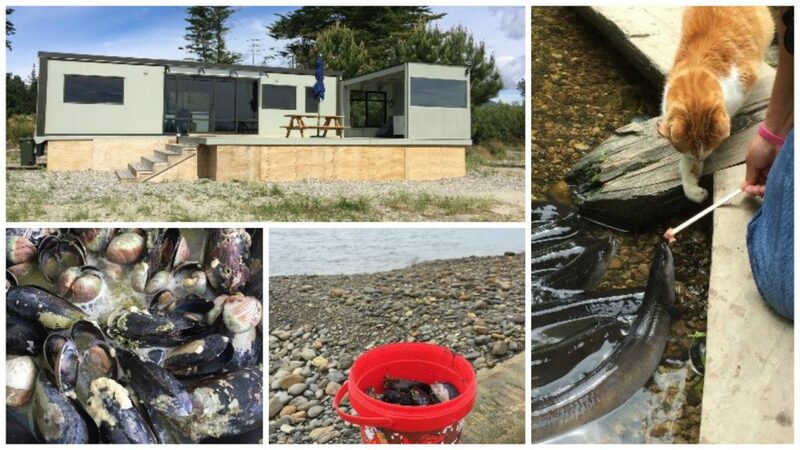 We experienced early on, and consistently throughout our trip, the hospitable and gracious spirit of the New Zealanders, often remarking that they were the friendliest people we had met travelling anywhere. In Auckland, Dan lept off the SkyWalk (the tallest freestanding structure in the Southern Hemisphere), where I was very content filming from the ground. 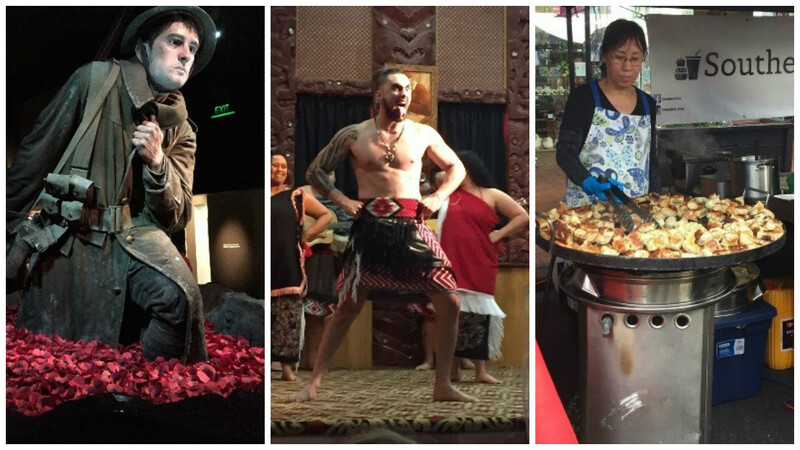 We took a train to Rotorua, where we feasted at the night market and were able to visit Te Puia, a New Zealand Maori cultural center. There, we witnessed a very cool reenactment of a haka, an ancient Maori war dance that is also performed during ceremonies, weddings, and by the country’s intimidating rugby team, the All Blacks. Te Puia is also a geothermal wonderland, and at night we sat on a rock wall that was kept warm by the nearby bubbling mud pools, including the Pohutu geyser. I also shot a gun for the first time at Adventure Playground, where only clay pigeons died. From Rotorua we flew to the southern tip of the northern island, Wellington. This is the capital city and is known for the waterfront and foodie culture. A stand-out activity was the free harbor side museum, Te Papa. There was way too much to see in the time we had, but the Gallipoli exhibit was particularly impressive. The museum worked with Weta Workshop (famous from work with the Lord of the Rings series) to tell the story of the Gallipoli campaign in World War I, where almost 3,000 New Zealanders lost their lives. The exhibit is filled with incredibly realistic large-scale (2.4 times human size) sculptures, freezing moments in time during the battle. They also created a website, if you want to get a better idea of the scope of the display. The final sculpture was standing in a bath of red paper poppies, a symbol of the great loss of life in war and available for visitors’ personal messages. The main way to travel between the north and south New Zealand islands is the 3-hour ferry across the Cook Strait. After wobbling off the ferry, we embarked on the slightly terrifying task of driving a rental car on the left side of the road, made more complicated by the large number of roundabouts in the country. Our next Airbnb was our favorite—a refurbished shipping container with large windows, a deck, and an outdoor kitchen. The container is actually settled on an island, so we were shuttled by motorboat across the river. At low tide we pulled fresh mussels from the pier, which made a surprisingly great dinner paired with lots of garlic, lemon, and wine. I had a birthday lunch on the mainland at Jester House, which along with a cafe menu, offered “tame eels” to feed in the nearby stream. The eels battled a local cat to yank the bits of raw ground meat, which was one of the strangest things I’ve ever seen. From there we flew to Queenstown, one of the southernmost major cities and known as an adventure capital. The city reminded me of a western U.S. ski town—a very walkable town on the edge of a lake and surrounded by gorgeous mountains. We rode a gondola up a mountain and raced in wheeled luge carts back down. 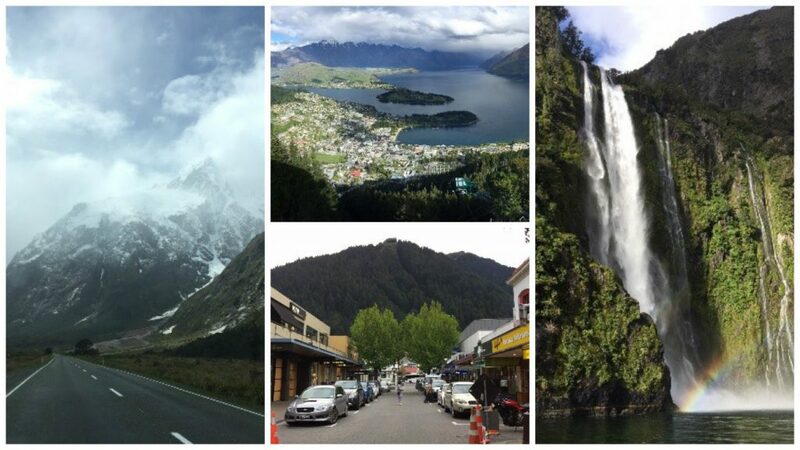 On one of our final days, we drove a few hours to the coast to see Fiordland National Park at Milford Sound, which has been referenced as the eighth wonder of the world. We took a small boat cruise through the Sound and witnessed sea lions, penguins, waterfalls, and more breathtaking views. The trip home was much more painful, including a 6-hour layover in Hawaii. Although I felt the familiar comfort of reentering the United States, it was also very evident when we crossed the border. Gone was the overwhelmingly friendly and helpful Kiwi spirit! Regardless, it was great to be back to the most comfortable bed in the world, and my travel bug was satisfied, for now. left side of the road roundabouts are the worst. I never know which side the traffic is coming from. Great blog. Harvesting your own mussels priceless.